Oh boy! My Helleborus are finally blooming! The beautiful pure white flowers of Helleborus niger are a welcome sight in February. I’ve been waiting for my Helleborus niger to bloom for a while now. Of all my Helleborus varieties, the white Helleborus niger is my favorite. The flowers are so beautiful and they make such a glorious display against the backdrop of fallen oak leaves in my garden. The flower stems were just beginning to poke up on February 5th. I became impatient a few weeks ago and decided to poke around under the “mulch” of oak leaves to see if there was any sign of flowers. I was excited to discover a multitude of flower stems with beautiful pure white buds just beginning to form. Oh boy, it wouldn’t be long. Two days ago, I looked out and there they were – bright white flowers with their beautiful yellow tipped stamens glistening in the sunshine! My first flowers of the new season! 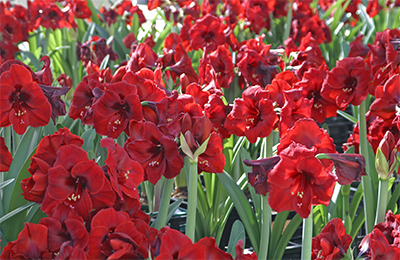 These blooms are the finest and most long-lasting of any winter flower, persisting for 2-3 months! What a wonderful treat in the midst of an otherwise dreary winter! Blooming in all their glory on February 21st. 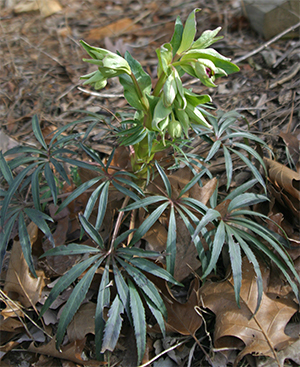 Helleborus foetidus has beautiful deeply divided foliage that adds wonderful texture to the garden. Another cool hellebore is Helleborus foetidus. The flowers of this species are not nearly as impressive but the plant is interesting just the same. It actually has nicer foliage in my mind. The finely cut older leaves are an attractive deep green tinged with red at the base. The new growth and airy clusters bell-shaped flowers are a contrasting apple-green. These plants really stand out in the early spring garden when nothing else is growing let alone blooming. 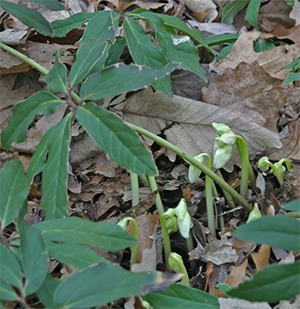 They are one of the earliest of the hellebores to bloom, sometimes blooming as early as December. 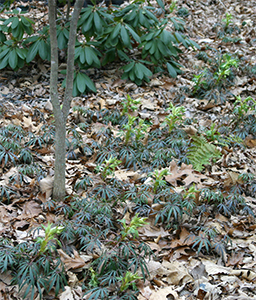 Helleborus foetidus makes an interesting display in winter with its clusters of bright green flowers. Helleborus foetidus comes up readily from seed and often pops up throughout the garden, a trait that may annoy some gardeners but I just let it go in this particular garden because it makes such an attractive display. Every once in a while I go through and thin some of them out but for the most part, I just let them grow. Helleborus orientalis is another popular species and I have a few of these planted in my garden as well. It has a variety of bloom colors from white to pink to deep burgundy. 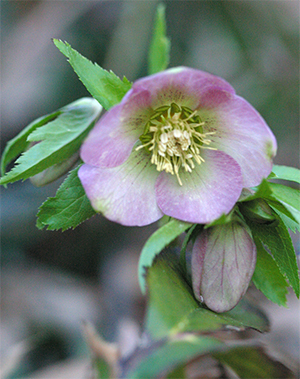 Helleborus orientalis, Lenten Rose, blooms a bit later usually in late February or early March. 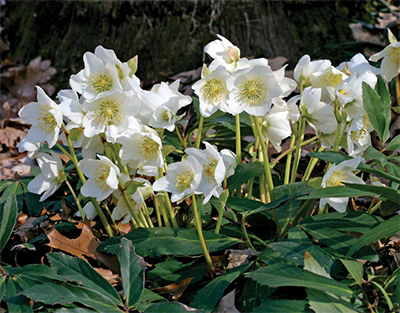 As an added plus, all the Helleborus varieties are very deer resistant and make an excellent evergreen ground cover that the deer just won’t touch! Years ago when I was teaching horticulture, we took a trip to visit some beautiful private gardens in Lynchburg, Virginia. I remember one garden where Helleborus orientalis was used as a beautiful ground cover similar to how people use Pachysandra or Vinca. It was gorgeous when I was there in May but I imagine it was really spectacular in February, March, and April when the bed was in full bloom! Wow! This attractive Helleborus orientalis has white flowers speckled with maroon. 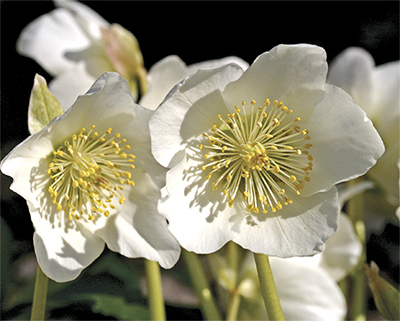 Helleborus are particularly well suited for planting under tall evergreen shrubs like Rhododendron or in a mixed woodland border in combination with other shade loving perennials such as ferns, Hosta, Epimedium, and Pulmonaria. They also make attractive plantings along woodland paths or planted in the rich, moist soil near a pond or other water feature. Look for some of these great plants to put in your garden. They are wonderful for the shade or bright shade garden and there are some really cool new cultivars available! chock-full of flowers and gardens! 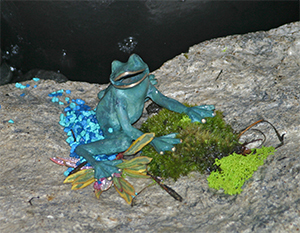 A frog fountain makes a fun accent in Sam's garden. Right from the start, the show was colorful and fragrant! The beautiful entrance garden designed by Sam Harris created a delightful welcome for visitors to the show. Filled with typical “Sam Harris whimsy”, the display was complete with flowers, frogs, fishermen, and fantasy. 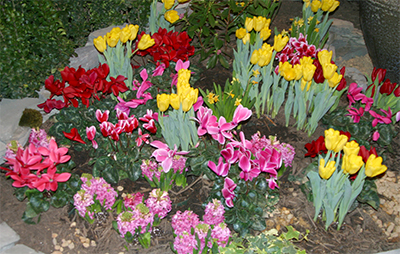 Tulips, hyacinths, daffodils, and cyclamen in full bloom were planted among a diverse selection of beautiful evergreen shrubs. Garden paths led to unique focal points throughout the display; a frog fountain, an attractive garden bench, a huge urn with colorful flowers, a bubbly disappearing fountain … It was a spectacular display. There was no shortage of colorful flowers in Sam's design! The more time I spent in Sam's garden, the more I noticed. He is a master at tucking little surprises into his designs - like this happy frog sitting in moss and pebbles on a big rock. 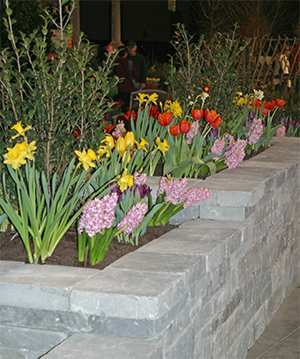 Many displays featured attractive stone walls, patios, and paths. 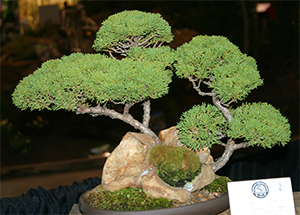 All the garden displays at the show had beautiful plantings of trees, shrubs, perennials, and flowering bulbs along with decorative hardscaping, and attractive lighting. Many had wonderful water features including streams with bridges, ponds, waterfalls and fountains. So much to see! It’s amazing how the designers are able to create these wonderful landscapes with complex hardscaping, running water, and beautiful blooming trees, shrubs, and flowers in the middle of a convention center and in the midst of winter. 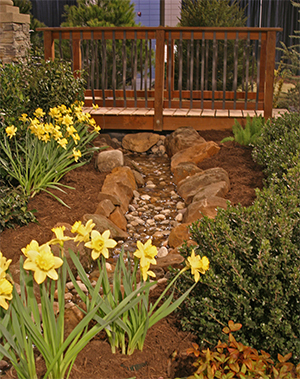 A gurgling stream is flanked by mulched beds of spring bulbs, boxwood and several varieties of witchhazel. A beautiful bridge leads to other areas of the garden. I also spent a lot of time wandering through the garden marketplace where many different vendors were on hand selling all kinds of great gardening goods and gadgets including native and exotic plants, garden art, tools, books, jewelry, gifts, and artwork. So much cool stuff! I managed to restrain myself for the most part but it was hard! 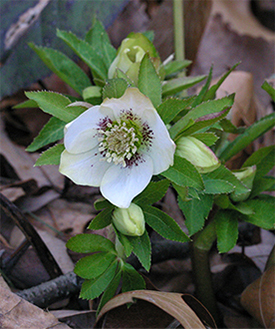 If you haven’t been to a flower show yet this winter, be sure to watch for one in your area. Flower shows across the country will continue well into March especially in the more northern areas. 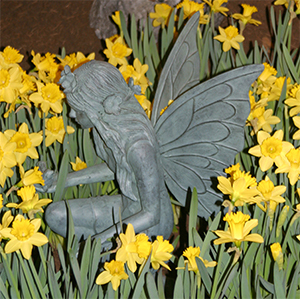 It’s a real treat to experience springtime during the waning days of winter – even if it’s only for a few blissful hours! One of my favorite displays featured fairies and several furry critters! 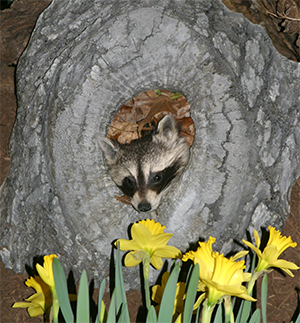 This inquisitive raccoon was peeking out of his cozy home to sniff the daffodils! 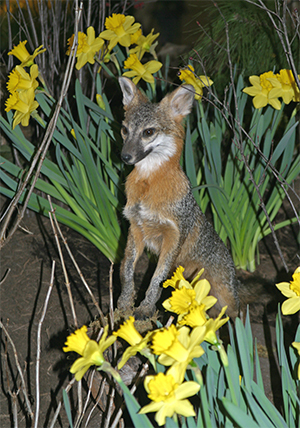 A beautiful gray fox was nestled amongst the daffodils. 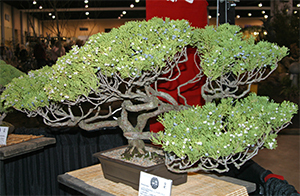 The bonsai display was amazing! A beautiful juniper complete with berries! Now this is a REAL Amaryllis FOREST! So many amaryllis blooming all at once! Just spectacular! I just couldn’t help sharing this photo I took when I visited the Bloomaker production facility yesterday! This is truly an Amaryllis forest! The Viettes are testing some amazing new varieties this year … There’s more to come! Next week I’ll share my pics from the Maymont Flower & Garden Show in Richmond. I’ll be there on Saturday – it’s going to be a great show! If you happen to be at the Maymont show on Saturday (2/12), be sure to catch Mark Viette’s talk “Gardening for Fun” at 11:30am. Look for a flower show in your area! There are a lot around in February and March. 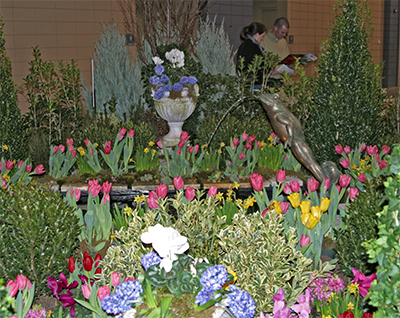 Next week (2/17 – 2/20) is the New Jersey Flower & Garden Show! Mark will be there, too! On Thursday afternoon (2/17) he will be at the show from 2:00 – 4:00 taking gardening questions from the audience during a LIVE taping of his radio show “Easy Gardening”. If you’re at the show on Thursday be sure to stop by and say hi – and bring your gardening questions! 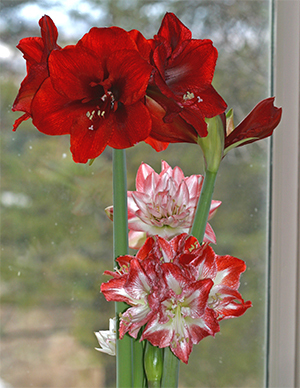 Oh my goodness – my amaryllis are incredible now! I promised to report back and I am so excited to share these pictures of my beautiful flowers. Since my last amaryllis post, the flower stems of my ‘Ferrari’ have shot up to about 24″ tall and one stem has burst open with four huge 7″ blossoms. These flowers have been gorgeous for at least 10 days and they are STILL going strong, showing no signs of fading – just spectacular! And red – what an amazing shade of fire engine red or should I say Ferrari red – WOW! The photos do not do it justice. This one is a keeper for sure. The second stem is just beginning to pop now and promises to be equally as striking with four more beautiful blooms to open! 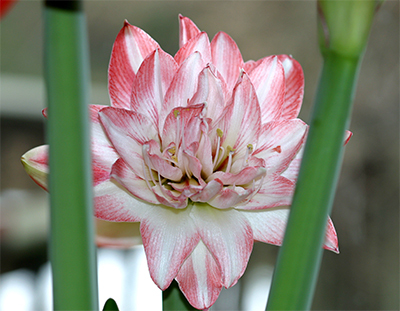 Amaryllis 'Blossom Bingo' looks like a beautiful water lily! ‘Blossom Bingo’ was an exciting surprise with beautiful 6″, fully double blooms. The flowers are a soft white with pink radiating from the tips down toward the base. Deep pink veins highlight each petal. The form of the flowers reminds me of a beautiful water lily! This flower stem has seven flower buds! Another keeper! 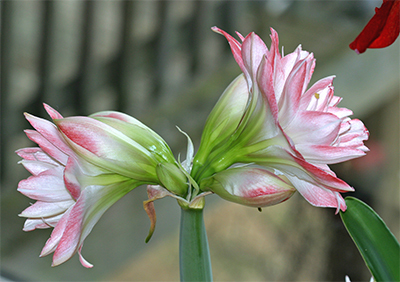 I have never seen such a beautiful double amaryllis. This flower stem of 'Blossom Bingo' holds seven flowers! ‘Angelique’ is a bit of a disappointment so far but it was a smaller bulb and I was suspicious that it might not perform as well. This is one thing that is so true with these plants – the bigger the bulb, the better the flowering with more stems, more flowers, and larger flowers. There are 2 flowering stems from this bulb but there are only 3 flowers on the stem that has opened and these are quite small. They haven’t fully opened yet so maybe they’ll be more exciting in a few days. The flowers are a double white with petals tipped in blush pink. I am reserving judgment on this one for now. Amaryllis 'Ferrari', 'Blossom Bingo', 'Minerva', and just peeking out - 'Angelique'. ‘Minerva’ continues to bloom away! The blossoms on the first flower stalk eventually faded after almost 3 weeks but the second stem is now in full bloom with 6 beautiful flowers! The third stem is growing taller and should burst into bloom about the time the second has finished. I anticipate this one will be giving me blooms for close to two months! 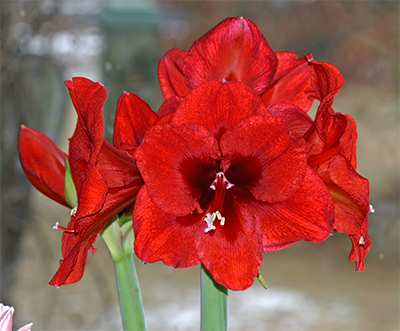 I’m totally sold on amaryllis now, especially when I can get huge bulbs like these from our friends at Bloomaker! They seem to bloom forever and … the best part is that my kitties don’t seem to bother them! I can display them prominently in the window at the end of our kitchen table and enjoy them whenever we sit down to eat!